The fourth day of the Forefeast of Theophany falls on January 5th. The Eve of Theophany anticipates the feast. On the 5th we read the Royal Hours, followed by Vespers and the Liturgy of St. Basil the Great. The Royal Hours are read on Friday, but there is no Liturgy. Vespers on the evening of the 4th, followed by Matins. The Liturgy of St. John Chrysostom is celebrated on Saturday morning. The Royal Hours are read on Friday, but there is no Liturgy. Vigil is served on Saturday evening, and the Liturgy of St. John Chrysostom is celebrated on Sunday. The Church hymns for this day read: "You have shown forth in the flesh from a Virgin in Bethlehem, now you hasten towards Jordan", "grant to all the faithful the salvation that comes through Baptism in Christ: for in this way it cleanses Adam, raises the fallen, humiliates the deposed torturer, opens the heavens, causes the Divine Spirit to descend, and grants incorruption to the communicants". "Let all the earth rejoice, let heaven be glad, let the world leap for joy, let the rivers clap their hands, let the springs and lakes and the deeps of the sea rejoice with them, for Christ is come to cleanse Adam", "Being Himself the Bestower of light, Jesus, not needing to be baptized, in the flesh descends into the stream of Jordan, wishing to enlighten those existing in darkness. Let us go fervently in faith to meet Him", "let us joyfully welcome Him with pure intention". As the holy water serves "for the cleansing of souls and bodies, and for the blessing of houses", the clergy on the eve and on the feast of Theophany go to the homes of laymen to sprinkle them with holy water. 1. Imperial (Royal) Hours: 1) Paramoea: Is. 35:1-10. Epistle: Acts 13:25-32; Gospel: Mt. 3:1-11; 3) Paramoea: Is. 1:16-20. Epistle: Acts 19:1-8; Gospel: Mk. 1:1-8; 6) Paramoea: Is. 12:3-6. Epistle: Rom. 6:3-11; Gospel: Mk.1:9-15; 9) Paramoea: Is. 49:8-15. Epistle: Тiт. 2:11-14; 3:4-7; Gospel: Мt. 3:13-17. Psalms 31 and 26 of the 1st Hour presents the Lord as the Pastor, Enlightener and Savior. The spiritual renewal of the faith in Jesus Christ is announced in the Paramoeas of the prophecies of the 1st hour. The Epistle and the Gospel tell about the Baptizer and Forerunner of the Lord who testifies about His eternal and divine greatness. Psalms 28 and 41 of the 3 rd Hour describes the authority and the might of the Lord over water and all the elements of the world. In the Paramoeas we hear the Prophet Isaiah, who foresaw spiritual rebirth through baptism. The Epistle reading speaks about the distinction of John's baptism from the baptism in the name of the Lord Jesus, and the Gospel lesson about the Forerunner, who prepares the way of the Lord. Psalms 73 and 76 of the 6th Hour describes the divine greatness and omnipotence of the Lord. In the Paramoeas the Prophet Isaiah beholds the grace of the salvation in the waters of baptism and calls believers to make it their own. The Epistle lesson inspires those baptized in Christ Jesus to enter into the renewal of life. The Gospel announces the Theophany of the Holy Trinity at the baptism of the Savior, about His forty day ascetic effort in the desert and the beginning of the preaching of the Gospel. Psalms 92 and 93 of the 9th Hour proclaims the royal greatness and omnipotence of the Lord. The Paramoeas of the prophecies describes the unspeakable mercy of God for the people and help full of grace opened to them in baptism. The Epistle lesson teaches about the appearance of the grace of God that saves all humanity, and the abundant outpouring of the Holy Spirit on believers. The Gospel narrates the baptism of the Savior and the Theophany. Thirteen Paramoeas are read in Vespers. Vespers Paramoeas: 1) Gen. 1:1-13. 2) Ex. 14:15-18, 21-23, 27-29. 3) Ex. 15:22-27-16:1 4) Joshua 3:7-8, 15-17. 5) 4 Kings 2:6-14. 6) 4 Kings 5:9-14. 7) Is. 1:16-20. 8) Gen. 32:1-10. 9) Ex. 2:5-10. 10) Judges 6:36-40. 11) 3 Kings 18:30-39. 12) 4 Kings 2:19-22. 13) Is. 49:8-15. Epistle: 1 Cor. 9:19-27; on Sat. and Sun. 1 Cor. 10:1-4; Gospel: Luke 3:1-18. The first Paramoea tells about the water "on which", at the creation of the world, "the Spirit of God was moving", pointing it out as the type of spiritual regeneration and enlightenment in the mystery of baptism. The second Paramoea describes the divine authority of the Lord over the waters of the Red Sea, parted for the salvation of Israel and joined together for the death of the Egyptians, and spiritually describes the mystery of Holy Baptism. The third Paramoea speaks about the omnipotence of the Lord shown over the waters of Marah, by the strength of grace was changed from bitter to sweet, and pointed out the twelve springs of waters in the desert for quenching the thirst of the people of God. After the third Paramoea the reader proclaims the Troparion, glorifying the Creator of the world who loves mankind and the Enlightener of "those sitting in darkness". The fourth Paramoea points out in every detail the grace of God over the waters of the Jordan, which opened a bottom for the passage to Israel. The fifth Paramoea tells about the authority of grace over the waters of the Jordan, which opened a bottom for the passage of Elijah and Elisha. The sixth Paramoea tells about the authority of grace over the waters of the Jordan given to Naaman, who was cleansed from leprosy through the sevenfold immersion in them according to the word of the Prophet Elisha. After intoning these three Paramoeas the reader again proclaims the Troparion, glorifying God, Who shines the light on "those sitting in darkness". The seventh Paramoea also repeats the one that is read at the Third Hour of the Eve. The eighth Paramoea tells about the "omnipotent grace of God over the waters of the Jordan over which the Patriarch Jacob passed". The ninth Paramoea tells about how Moses was taken unharmed from the waters of the river. The tenth Paramoea tells about "the grace shown in the dew of the fleece of Gideon strengthened his faith in calling God for the salvation of the Hebrews from the Midianites. The eleventh Paramoea tells about Prophet Elijah pouring water over his prepared offering three times and this action did not inhibit the fire led down upon it through the prophet. The twelfth Paramoea is also read at the Ninth Hour on the Eve. The Epistle at the Liturgy preaches about the fulfillment of the ancient paradigm (Ex. 13:21.14:22) in Jesus Christ who accepted Baptism. The Gospel tells the good news about the sermon by the Forerunner about Christ to the people of God. 2. The day of the Eve of Theophany was especially solemnly honored by our ancestors and was a day that was extremely holy in the people's consciousness. Being occupied with dressing and fortune telling, considered permissible on the Forefeast of the Baptism, known to the people by the name of "A Baptismal Evening" (with Jan. 2), on the Eve of the Baptism this was considered a great sin. On the Eve of the Baptism everyone considered it an indispensable sacred obligation to visit the temple. To eat fish on the Eve of Theophany was considered as the greatest sin. Also it was not permissible to eat with oil. Everyone, in compliance with the requirement of the church Ustav (Rubrics), considered it a sacred duty to fast on this great day even up to the blessing of holy water (as this even now is still followed, unfortunately, only in some pious families), did not dare to eat anything. 3. On the Eve of Theophany as on the day of the blessing of water with the cross, we have received the custom to trace out crosses with chalk on the doors, windows, etc. prominent places of the building, for protection from harmful action of the evil spirit. But in some places of Lithuania they write in Latin letters G. M. В., which are the first initials of the magi: Gaspar, Melchior and Balthazar, who brought gifts to the born Savior, and only, if they are illiterate, write instead of these letters three crosses. And in Kholm Russia, Belarus and some places in Little Russia a large candle called "gromnitsia" is kept in each home which the hostess, being sent to church, takes with herself for the blessing, after returning with the holy water of the Jordan she lights this candle, and with its flame "smokes" on the beam and above the doors the form of a cross so that the evil one will not dwell in the hut. And for each member of family she burns a pinch of hair on the head "In the name of the Father and the Son and the Holy Spirit". 4. The allowance to drink Theophany water instead of communion of the Body and Blood of the Lord could occur from deep antiquity, shortly after the canons were made, who excluded sinners from communion for a long time. For the consolation of those repenting who have declared sincerity of repentance, it was necessary to allow the Theophany water. (Archpriest Nikolsky, Concerning the Services of the Russian Church, having been in the previous published theological books, page 290, St. Petersburg, 1885). There is no basis to prohibit partaking of the Theophany water to pregnant women nor in general to women who are menstruating: this water is sprinkled even "in all places and shabby, and everywhere". 5. By the way, during an earlier time, according to the witness of the Domostroi (Manager), we had the custom to wash with holy water everything found in the house of holy icons. During an earlier time there existed also a custom in which the Old Russian love for the needy was so clearly expressed: on the eve of Theophany early until dawn our ancestors went to the prisons and the homes of poor men with bountiful alms. On this day every Russian considered it an obligation to give some food to the needy, so that poor men had something to break the fast with on the next day. Unfortunately, the piety of our ancestors was easily reconciled with pagan customs and superstitions, which even until now are in some places strong in our people. In villages, on the Eve of the Baptism, elderly women collect snow from the piles, in full confidence that as one can bleach linen cloth by dipping in lye and sun, and then the water will not need to be done with sun and lye. The snow collected on the evening of the Baptism, according to the belief of the peasants, can protect the artesian well water all year: all that is necessary is to bring in the snow from the field, to purify it in the artesian well, and then from it will be help and under this help which lasts all year, even if there isn't a drop of rain all summer. With the snow collected on the Eve of the Baptism, peasants in the villages heal infirmities as paralysis in the feet, dizziness and spasms. The Baptismal supper among the Belarus is called "shchodra", and among the Little Russians "hungry evening", or kutiya. This "hungry evening" supper as some people think is so called because the peasants did not eat anything all day, but at the evening meal use up everything that is prepared. 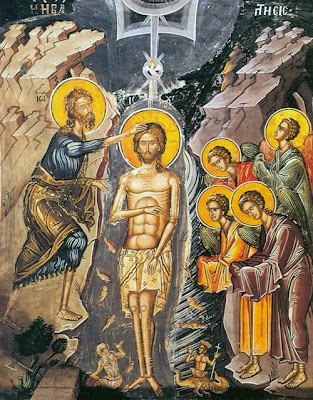 The belief exists, that at midnight on the Eve before Theophany the water is stirred, in commemoration of the Baptism of the Lord done at this time. This is why some people go to watch for this, and try within that instant of this imaginary wonderful commotion of the water to take the water in jugs, reverentially keep it, considering it something that does not spoil and attributes to it some special healing qualities.